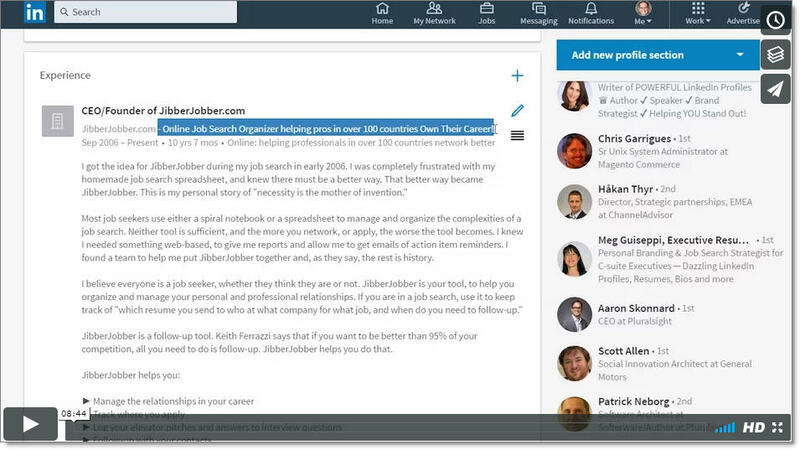 Today I am adding the twenty three videos that make up the fifth edition of the LinkedIn for Job Seekers course into the JibberJobber Video Library. I used to sell this as a DVD, then as a streaming course, for $50. But now you can get this course, AND all of the other courses, AND JibberJobber Premium, for one year for only $60. It’s like it’s Black Friday all the time around here Just login and then click the bottom link to upgrade to get access to this course, the rest of the video library, and all JibberJobber Premium features. LinkedIn Search Optimization: one of the reasons people upgrade is to get better search results. I tell them, why not learn how to use LinkedIn search better, so you get better results whether you upgrade OR NOT? 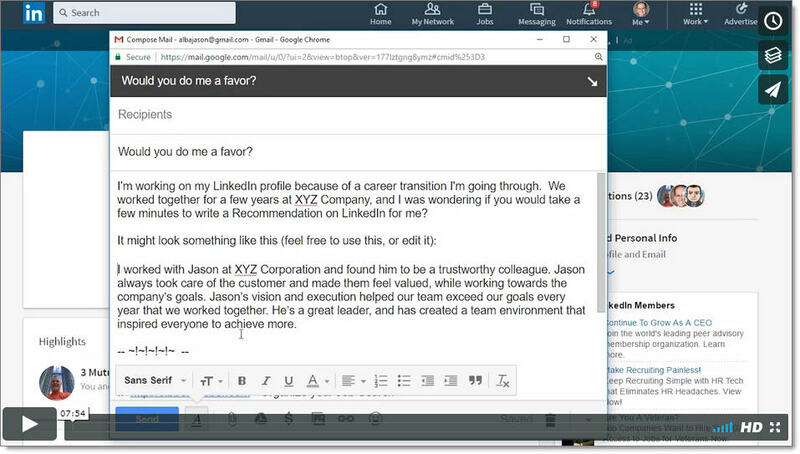 Asking for and using Recommendations: LinkedIn has made a big deal out of skills and endorsements, but Recommendations is, in my opinion, much more powerful. This is a great opportunity to network, and get specific language you can use for your personal branding. In this video I teach you what you are really after (what kind of language is valuable to you), how to ask for a Recommendation and get one that is awesome (instead of vague dribble), and then what to do with the Recommendation once you get it. 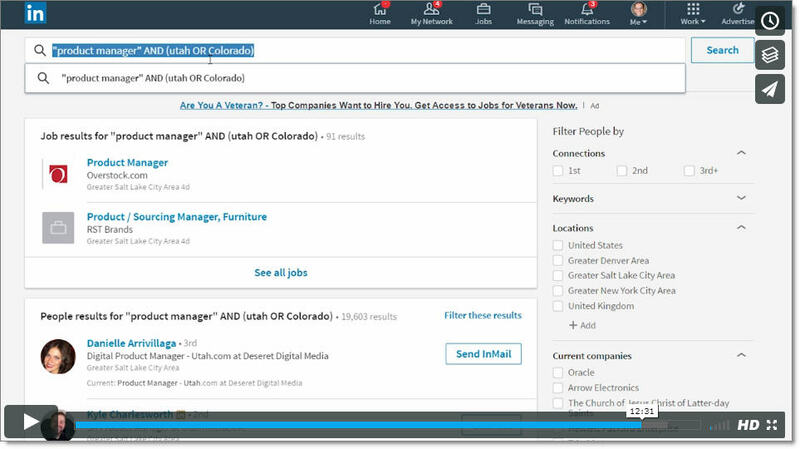 Optimizing Your LinkedIn Profile: Below The Fold: LinkedIn made some HUGE changes to your Profile in 2017, and it’s so important to understand what we can do to still have people find, read, and be impressed with our Profile. The beauty of my LinkedIn Profile writing system is that you can add to it and tweak over time… you don’t have to sit down for to solid days and pour all of your creativity into it. Let’s make your Profile great! Those are just three screenshots… you can see the videos are about ten minutes long…. I tried to make them shorter because all the experts say we our attention spans are too short for anything over three minutes, but really, there’s just too much to say. So, you get about ten minutes to learn what you need to learn. Here’s the table of contents… I’ll add and update this over time to keep it current. Want access to this? Go to JibberJobber, login, then click Pricing or Upgrade at the very bottom. You’ll see this new course up by tomorrow night under Tools >> JibberJobber Videos.